When we invoke the names of famous artists of the past, we refer to their most hallowed work—Orson Welles simultaneously means Citizen Kane, for example, or War of the Worlds, and H.G. Wells means The Time Machine or… War of the Words. It happens that when these two artists got together in 1940, they found that their worlds, which had already met in Welles’ notorious broadcast, had quite a lot to say to each other, genially trading stories, ideas, and mutual admiration. Joyce, writes Ben Jackson at the London Review of Books, “arrived drunk and poorly dressed; Proust, draped in furs, opened the door.” Then, writes Williams, the two men sat in chairs side by side, while “partisans” waited for “the wits to sparkle and flash.” Instead, they kvetched in the sports-and-weather small talk of two elderly men meeting in a doctor’s waiting room, or two Samuel Beckett characters, beset by petty complaints of ultimate importance. Ford Madox Ford confirms the account, but the party’s host, novelist Sydney Schiff denied it, reports Joyce’s most respected biographer Richard Ellmann. Ellmann doesn’t seem to favor one version or another, but he does give us Joyce’s own version, multiply attested. The Ulysses author remembered that their “talk consisted solely of the word ‘No.’ Proust asked me if I knew the duc du so-and-so. I said, ‘No.’” Proust was asked if he’d read Ulysses, and likewise replied in the negative. “The situation,” Joyce remembered, “was impossible.” Other guests remembered the meeting similarly. 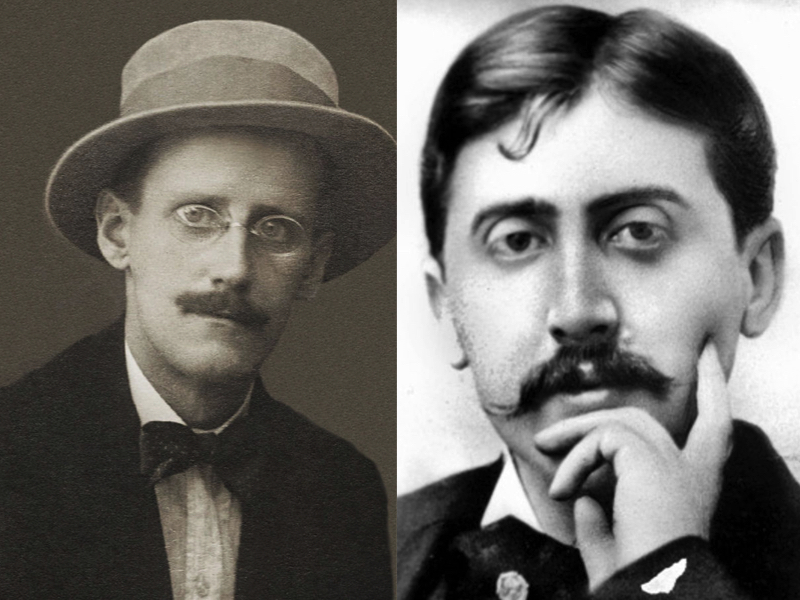 Although it’s said that both writers confessed to not having read the other, Jackson notes that when Joyce “did admit to passing his eyes over a few pages he declared that he did not see ‘any special talent.’” He also confessed to some envy of Proust’s comfortable circumstances. Proust, who died six months later, left no mention of their meeting. My colleague David Lasky illustrated this as a comic book story once. David Suchet in the role of Hercule Poirot always puts me in mind of Proust for some reason. The dapper fastidious dandy who avoids contact with anything to do with the elements, yet someone who can see inside people straight away without any prejudice or blinkers. Joyce does defend Proust’s psychological acumen in Arthur Powers’ Conversations with James Joyce. I remember reading somewhere – I think in Ellman’s Joyce’s biography, that their meeting took place somewhere else altogether, and that Joyce started to smoke and almost gave Proust a heart attack, since he had asthma, though I don’t think I’ve ever read of this encounter before. Um, shouldn’t the title to this article be a little more literarily sound? I mean “and totally bored each other”? Seriously!